Before beginning my third year in the Statistics PhD program this fall, I had the opportunity to present my Master’s research at the Joint Statistical Meetings (JSM) in Seattle, Washington. When my abstract was accepted last spring, my husband Mike and I figured, "Why not use the opportunity to drive half way across the country and visit national parks along the way?" So, that’s what we did! We thought about our trip for months. Although we thought we had planned every detail, nothing went as planned–and it was better than we could have imagined. Our road trip was a lot like the journey of graduate school. I’d like to tell you about what it was like attending such a big conference and share a few of the lessons I learned along the way. 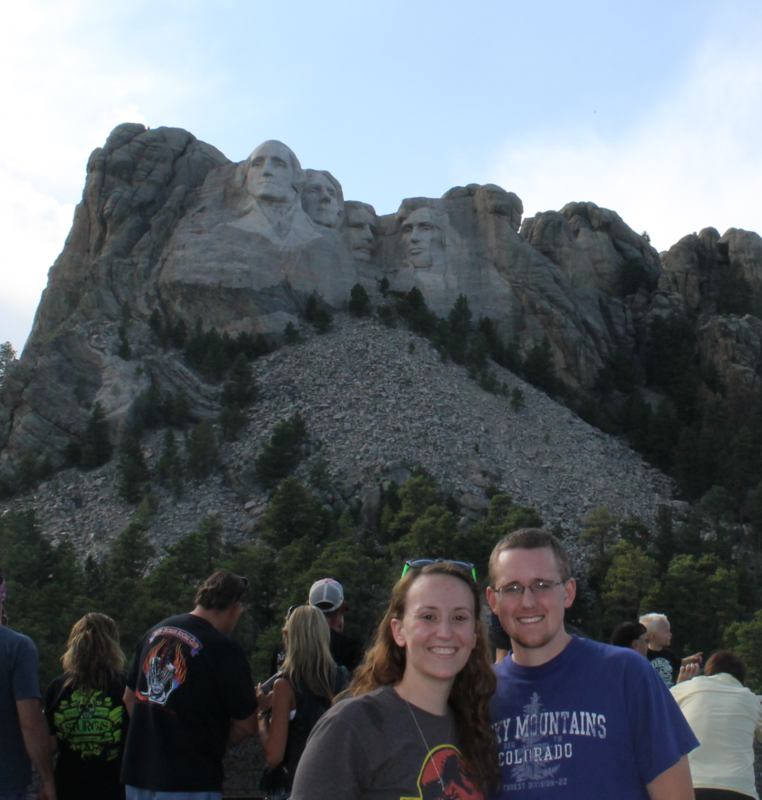 We made a stop at Mount Rushmore on our way to Seattle, WA. 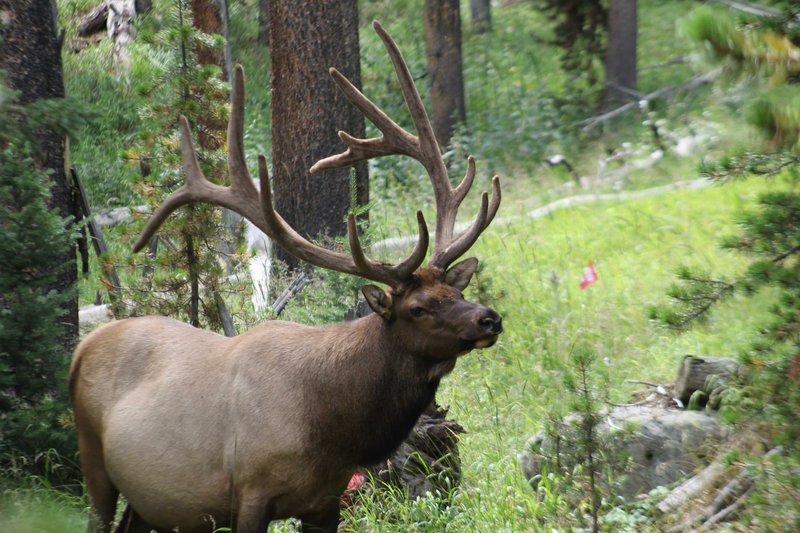 While traveling through Yellowstone and Glacier National Parks, we saw an astonishing amount of wildlife including a mother moose and her calf, several large herds of bison, and the largest elk we’ve ever seen. One of our stops on the way to Seattle was Grand Teton National Park. We had thought it would be easy to get a campground, but when we checked in with a ranger, we learned that campsites get booked months in advance. We were lucky, though–someone had just canceled their reservation, and we were able to get their campground. The only problem was, the spot was far from the main road and difficult to find. On the way to our very secluded campground, we happened upon a huge herd of bison and a small group of pronghorn antelope. After claiming our campsite, we made our way to Jenny Lake for what was supposed to be a short hike. The hike took much longer than expected, and we made it back to our campsite only just before dark to pitch our tent. There were many lessons learned in Grand Teton. The first was to always make sure to reserve a camp site well in advance or you might end up driving all over the park, desperately trying to find a place to sleep for the night. Similarly, in graduate school, you have to plan ahead and know your deadlines. You can’t wait until the last minute to file paperwork or you might not be able to present your dissertation or graduate! The other, related lesson we learned in Grand Teton was to never trust the estimated distance on trail signs because what you believe to be a 6.6 mile hike can easily turn into a more than 8 mile hike. In graduate school, it’s important to know what you’re getting yourself into. Know what courses and exams you need to take to complete your program and know your advisor’s expectations. Filing your Program of Studies early in your degree helps coursework to proceed smoothly. By the time we reached Seattle, Mike and I were absolutely exhausted. We knew we had planned an intense trip, but we had no idea how tired we’d truly be. We were grateful to be in one place for a few days! In my four days at JSM, I attended several valuable sessions. Some of my favorites discussed bias in the workplace, educational research, women in leadership roles, and book banning. My favorite session, “Career Insights from Women in Leadership”, was an invited panel featuring five incredible women from the National Institutes of Health, the Iowa State University Department of Statistics, IBM, the National Institute of Statistical Sciences, and Biogen Idec. Panelists spoke about opportunities for career advancement, challenges with sexism in the workplace, and balancing work and family. 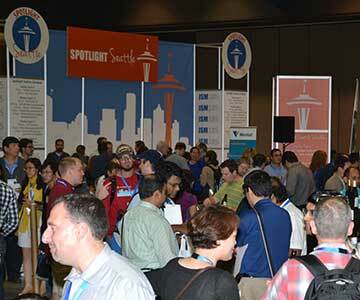 The Joint Statistical Meetings allowed me to network, hang out with friends and colleagues while collecting swag from vendors at the EXPO, learn about emerging research and speak with prospective employers, share my research, and gain confidence in my abilities. Presenting research at a professional meeting is one of the most valuable experiences you can have while in graduate school. You can learn about current research, make connections with other researchers in your field, and you have the opportunity to communicate your science effectively to an audience of experts and interested scholars. As part of a panel, I presented my Master’s research, “Modeling Undergraduate Retention to Aid in Making Programing Decisions at Universities.” By presenting alongside five other statisticians who research education, I got to make new connections between my work and other researchers' work. I learned to be open to professional development opportunities. Thanks to my presentation, I have new professional connections and a few ideas for future directions for my research. I always thought that Seattle would be a fun place to visit, but I never thought it would be on the list of places I'd consider moving to. But the city surprised us. To see the city, we visited the Sky View Observatory, which is twice as high as the Space Needle. One evening, we enjoyed third-row seats at a Seattle Mariners game. Mike made a day trip to Mount Rainier National Park while I was at the conference. An evening ferry ride to one of the islands in the Sound granted us a beautiful view of the Seattle skyline. We also explored Pike Place Market, making our contribution to The Gum Wall and watching fresh fish get hurled over the counter into the crowds. We did a lot of walking and ate a lot of seafood. I absolutely fell in love with Seattle. I learned a valuable lesson: be open to the different places you could live—you never know where you might see yourself someday. I can’t wait to go back, either for vacation or for employment. It’s good to have an open mind about where your degree can take you! 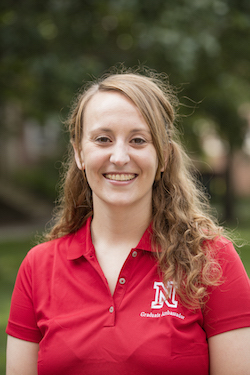 A good friend of mine graduated with her Ph.D. in Statistics from UNL in August. She interviewed for a tenure-track position at a private religious institution in the Midwest. After she visited for an interview, she was surprised by how much she liked the city and her potential colleagues. After she accepted the offer, she’s found the job and the city everything she hoped for—and more. After the conference ended, we made our way down the Oregon Coast to Coos Bay, the home of the late Steve "Pre" Prefontaine, one of the best distance runners the world has ever seen. We visited several of the memorials around town, including a room in the art museum dedicated to Pre and a gift shop inside Huggins Insurance. Steve Prefontaine left his mark on the world and the people of Coos Bay love and honor him to this day. We learned that no matter how long you’ve been gone, the people who love you will remember you. In graduate school and in life, I believe it’s important to think about the legacy you will leave behind. What mark do you want to leave on the world? We continued on to Umpqua Lighthouse and Cape Blanco State Parks for beautiful views of historic lighthouses and the Pacific Ocean. Further down the coast, we stopped in Port Orford, Oregon. No sooner had we stepped out of our car than a man introduced himself and, having assumed from our license plates that we had never seen a gray whale, showed us one just off the coast. We stood and watched that whale for about an hour before driving to Crescent City, California to see the redwoods and watch the sun set over the Pacific Ocean. 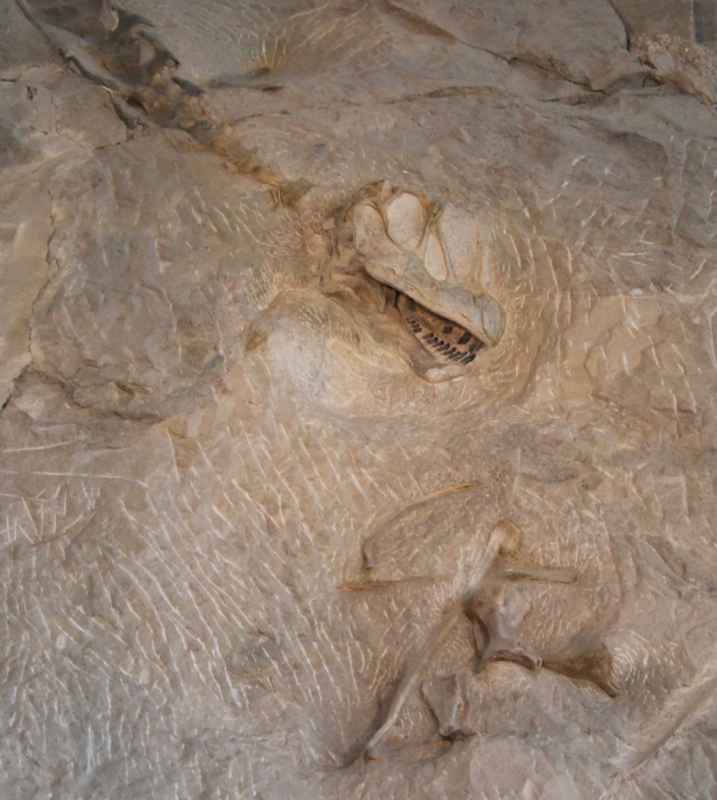 At Dinosaur National Monument, we viewed hundreds of dinosaur fossils in their original locations. Over the next three days, Mike and I raced home. On the way, we stopped to see Crater Lake, surrounded by heavy wildfire smoke, and Dinosaur National Monument. On the final day of our road trip, we were dodging summer thunderstorms all the way through Nebraska. It was a great reminder that sometimes you’ll encounter challenges you have to overcome along the way—and your destination rewards you for your hard work. We were so happy to be home, in our own house, with our dogs! If you ever get the chance, I would highly recommend taking a road trip across the country. Road trips can teach you a lot – about graduate school, about life, about relationships, and about yourself.